I worked on this a lot this weekend. I'm loving it!! Blackbird Designs "Anniversaries of the Heart," 40 ct. Meadow Rue, Various hand-dyed threads. I can't believe I put this away for so long. I'm having so much fun stitching it. I'm already looking forward to the next block! Lovely progress on your big BBD piece! I'm sure it will look grand! Now, off to check out your new site. Beautiful progress! Valentine Rose is really coming along! Gorgeous!!!!! Isn't it such a fun project :-). What a pretty design, I don't think I have seen this one before. Is it a monthly (12 panel) design? I have the Snow Garden #1. I just need to start stitching. Both your look so great !!! Beautiful, Nicole! 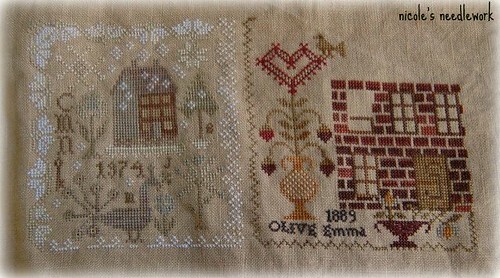 I still haven't picked up all the threads I need for this but I so want to stitch it! I haven't had a chance to head over to your forum yet, but I have it bookmarked! Love this BBD series! Yours looks amazing. looking real good Nicole!!!! fun isn't it???? 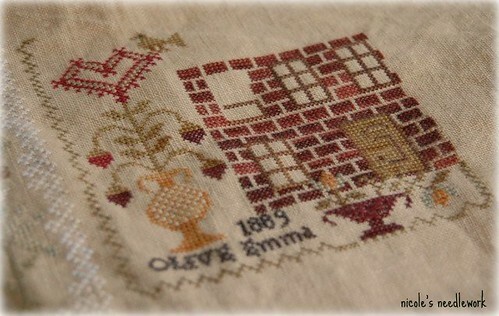 I am so excited about the sampler lovers forum! Having a bit of trouble signing up; will have to try again tomorrow. Off to stitch on Prairie Schooler's Christmas Eve. Love your AOTH! I am working on block one. Beautiful work Nicole. I love it!! My absolute favorite - Gorgeous is your work on the lovely "Valentine Rose" You should be so very pleased !!!!!!!!!!!!!!!!!!!!!!!!!!!!!!!! 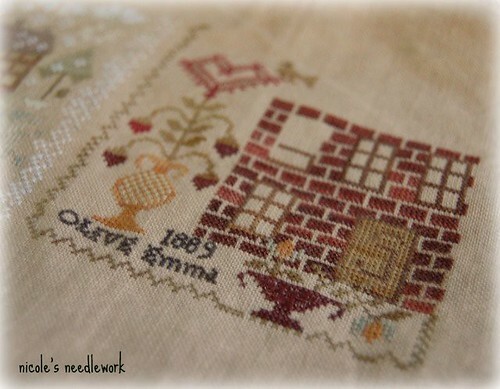 What is it about red bricks cross stitched in different shades that gets me every time? I've been seeing bits and pieces of this all over blogland, and while I can't take it up quite yet, it's going on my long-term "Must Do" list. I love this, I think I'm gonna have to do it sometime...thanks for sharing.. Very pretty indeed, Nicole. That's going to be a lovely piece. You do such beautiful work. I just joined your board, too, even though I'm not doing much stitching myself these days. Your BBD sampler is coming right along and looking wonderful. I am having trouble with your new site. I guess I am meant to only blog. Beautiful! You really ARE a fast stitcher, aren't you? Great project! I've held off on buying this one, but I really love seeing everyone's progress. I may have to cave at some point. Thanks for setting up the forum. I'll have to check it out. So pretty!! You're getting on with this real fast. Congratulations on completing the next block! You have a very fast process!